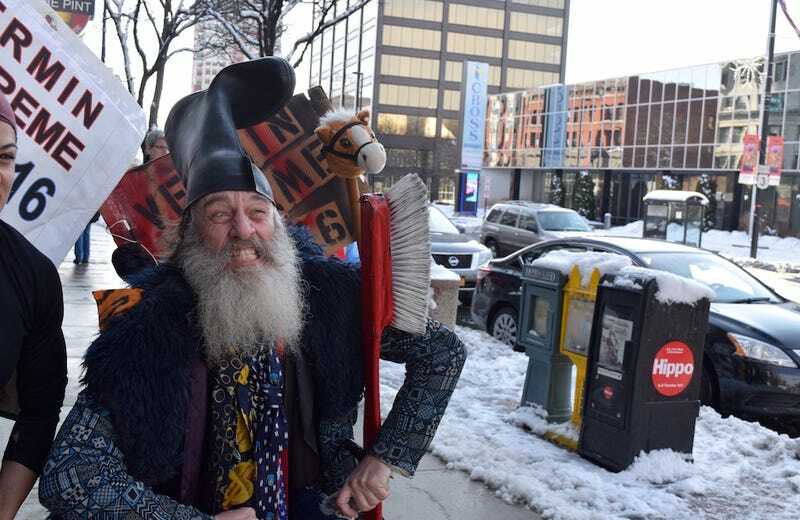 On the way to New Hampshire, my friend Joanna and I listened to a radio segment about a man named Vermin Supreme, a performance artist and political satirist who wears a boot as a hat and is running for president for the 7th time on his“pony economy” platform. “Vermin Supreme—find him,” I typed in my phone. Luckily, Vermin found us. We spotted him—armed with a giant toothbrush and a Gandalf beard, his companion wielding a hobby horse—through the window of the Bridge Cafe in downtown Manchester, surrounded by a fast-growing crowd. I sprinted outside. “I’ve been running since ‘92 in the New Hampshire primary, and I’ve been utilizing some simple, elegant and very effective tools to get my message out, of course including something so simple as wearing a rubber boot on my head,” he told me, when I asked what he’s been up to lately. What do you consider the most important issue in the upcoming presidential election? I asked him. What about the second-most important issue? We took a selfie, and then I went back inside and stared at my Caesar salad.